As I explained last week, the United States has begun to realize the importance of Africa in its foreign policy agenda over the past several decades. Particularly because of the U.S. War on Terror and the increasing emphasis of furthering development throughout the Global South, the U.S. has realized the need to end African wars and conflicts in order to aid in development and to discourage international terrorism. As an effort to help bring an end to African conflicts and to encourage development across the continent, the U.S. has contributed to the various UN missions in Africa as well as created its own initiatives, such as ACOTA, GPOI, and AFRICOM, in order to aid and respond to security threats on the continent. However, these actions alone will not achieve the goal of encouraging sustainable development and ending conflicts. This post makes further recommendations for what can be done to create a more independent, democratic, and prosperous continent that will better serve U.S. interests, and more importantly African interests. Other strategies that are recommended for responding to and ending African conflicts include building South Africa’s capacity to act as a continental (or at least regional) hegemon when it comes to peacekeeping, increasing trade and development, as well as supporting democratic regimes that will act as models for their region. South Africa’s transformation from an Apartheid regime in the 1990s to Africa’s strongest democracy is a sign of the continent’s potential. Many argue that South Africa should play a greater role in peacekeeping efforts throughout the continent, while some contend that it is only with South Africa’s assistance that Africa will see peace. The Cold War taught America a valuable lesson on the importance of working with democratic partners, which “spreads the burden and gives policies greater legitimacy”.1 If the U.S. truly did learn from this lesson, it would acknowledge the importance of a partnership with the South African government for “conflict prevention and democratic development in Africa”.2 In order for South Africa to act as a continental watchdog of sorts, the U.S. needs to ensure that it supports Pretoria’s government, increases trade, and assists in responding to South Africa’s HIV/AIDS crisis. Through these efforts, South Africa’s democracy and economy will continue to grow, which will build its capacity to better respond to armed conflicts and crisis in the southern Africa region and perhaps throughout Africa as a whole. Although South Africa is not a perfect democracy, especially with the government's recent responses to the strikes, it is nonetheless the best of the continent and deserves more respect, partnership, and assistance from the U.S. government. If Washington is sincerely dedicated to ending African conflicts, then it must develop a consistent policy for encouraging economic development, especially in Africa’s least developed countries. One way to increase economic development in Africa is to increase trade. According to Stremlau, “Less than one percent of U.S. trade and investment is with sub-Saharan Africa. Of that, nearly 85 percent goes to just four countries. Three are oil producers – Angola, Gabon, and Nigeria – and the other is South Africa”.3 If U.S. were to increase trade with African businesses, it would foster economic growth that would then improve education efforts, health services, and infrastructure. These improvements would create jobs and improve the quality of life for millions of Africans, thereby lessening the likelihood for armed conflicts to emerge. Lastly, the U.S. needs to create a steady policy for supporting African democracies, which given America’s past relationship with ‘democracies’ in Africa, may be easier said than done. During the Cold War, the U.S. was primarily interested in maintaining “reliable allies” regardless of “what went on within those allied states”.4 Some of America’s most trusted allies during the Cold War included Samuel Doe of Liberia, Siad Barre of Somalia, and Mobutu of Zaire, all of whom were involved in wars and destroying the economics of their states. During this time, the U.S. often hailed these leaders as ‘democratic’, but history has now exposed the truth. For Africa to develop a relationship built upon mutual trust with the U.S., then Washington needs to support real democracies and refuse to collaborate with despotic leaders. The U.S. still needs improvement in this area because some of its more recent allies include Kagame of Rwanda, Zenawi of Ethiopia, Afwerki of Eritrea, and Museveni of Uganda – all of whom are considered undemocratic. However, through partnering with these undemocratic yet “market-oriented strongmen”, Washington hopes they will “bring stability to their countries” as well as liberalize their economies according to IMF and World Bank standards.5 The issue in this lies in the fact that Washington may be placing too much emphasis on liberalization instead of democratization which, as history has shown, quite often does not benefit the average African. In addition to responding to and preventing conflicts in Africa, another issue high atop America’s Africa agenda is combating ‘terrorism’ in Africa. Although the number of failed and failing states in Africa has diminished in recent years, there are still many territories that are considered ungoverned, which the U.S. now considers to be “potential breeding grounds for terrorists”.6 Attention has been drawn recently to the possibility of terror threats emanating from Africa. With the Al Qaeda bombings in 1998 on the US embassies in Dar es Salaam and Nairobi, and with the recent Christmas day bomber originating from Nigeria, along with other militant groups functioning throughout the Sahel, the U.S. government now recognizes the importance of Africa in its security agenda. However, it is important for the U.S. to not over-exaggerate the threat of terrorism in Africa. 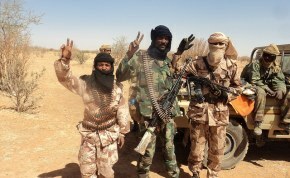 As Copson notes,“…there are enough indications of a terrorist presence to ‘justify caution and greater Western involvement…however…the Sahel is not a hotbed of terrorist activity’”.7 To respond to this threat, the U.S. has used AFRICOM, ACOTA, as well as developed the Trans-Sahara Counterterrorism Initiative (TSCI) and the Pan-Sahel Initiative (PSI) which aims to “halt the free movement of Islamist militants in the Sahel-Sahara region”.8 These various U.S. initiatives were created to help fight against those who the U.S. deems as ‘terrorists’ as well as address the situations the U.S. believes leads to the creation of terrorists, such as poverty. However, Washington’s belief that poverty breeds terrorism may be inaccurate, or at least over-exaggerated. As the Nigerian Christmas Day bomber illustrated, not all terrorists are from poor, rural areas of Africa who embrace terrorism to address their grievances. On the contrary, the Nigerian bomber was educated in England and came from a wealthy family – fitting a description completely opposite to what Washington thinks typically creates a ‘terrorist’. 1. Washington’s counterterrorism initiatives should not trump social and economic development programs. 2. U.S. must distance itself from its Cold War policies of supporting undemocratic regimes. Even if states agree to aid the U.S. in counterterrorism efforts, that should not be an excuse to allow them to partake in undemocratic policies. 3. The U.S. needs to take seriously its peacekeeping efforts in Africa. If the U.S. wishes to strengthen its relationship with Africa and make up for the “sins of the past”9, then it needs to encourage social, economic, and political development, all of which will be facilitated if armed conflicts cease to persist. All things considered, Washington’s best interest lies in partaking in state-building efforts in Africa. This approach would help combat poverty, build democratic institutions, and grow domestic economies, all of which would address many of the root causes of Africa’s wars and likely limit the chances of terrorism from becoming a significant problem. State-building in Africa has never been at the forefront the U.S.’s Africa agenda, but if America is sincere in its desire to foster a better relationship with the continent and see to its development, then it is the only approach that will create a sustainable and trustworthy policy that will benefit both sides of the Atlantic. 1 John Stremlau, “Ending Africa’s Wars,” Foreign Affairs, 79, no. 4 (2000): 118. 6 Brennan M. Kraxberger, “The United States and Africa: Shifting Geopolitics in the ‘Age of Terror’,” Africa Today, 52, no. 1 (2005): 48. 7 Raymond Copson, The United States in Africa, (London: Zed Books, 2007), 116. 8 Brennan M. Kraxberger, “The United States and Africa: Shifting Geopolitics in the ‘Age of Terror’,” Africa Today, 52, no. 1 (2005): 59. 9 Sulayman S. Nyang, “US-Africa Relations Over the Last Century: An African Perspective,” Social Research, 72, no. 4 (2005).